Being the cultural capital of India, the region in and around Kolkata is certainly culturally developed. Sagar Island is one amongst these culturally developed places around Kolkata which are considered significant pilgrimage sites in Hinduism on account of the presence of the holy waters of Ganga. Even though Sagar Island is home to several temples and religious sites, it is still a weekend destination for nature lovers and travellers. From the sacred beauty on the island to the enchanting views of the sea, there is a lot to explore in and around Sagar Island. So, why not plan a trip from Kolkata to Sagar Island this season? Sagar Island experiences a hot and humid type of climate; therefore, it will be wise to avoid visiting this pilgrimage site during the summer season. The best time to visit Sagar Island is from September until the end of April, as during this period, the temperature conditions are optimum letting you explore the surroundings comfortably. Being an island, it cannot be reached directly by road. You can take a cab from Kolkata to Namkhana and then from there you can catch ferries which run at regular intervals. The nearest airport is only at Kolkata at an approximate distance of around 106 km. However, it is preferable to commute on your own. While on your way to Sagar Island, you can take a break at Bishnupur before you end your road journey at Namakhana. Bishnupur is a small town in the Bankura district of West Bengal which is popular amongst travellers for its temples and ancient monuments. The major speciality of the town which attracts tourists from all over the country lies in its terracotta temples and buildings. Apart from historical monuments, Bishnupur is also famous for Baluchari sarees which are known for the depiction of mythological drawings. The history of Bishnupur dates back to the era of the Gupta Empire. Most prominent places to visit in Bishnupur include Rasmancha, Hawa Mahal, Jor Mandir Complex and Madanmohan Temple. Also known as Gangasagar or Sagardwip, Sagar Island is a beautiful place lying on the plains of the Ganges delta in the South 24 Parganas district of West Bengal. Being surrounded by the waters of river Ganga, the island is considered as one of the holiest places in India. Following are some of the major places to visit on Sagar Island. The presence of Kapil Muni Ashram, which is said to have been in existence since time immemorial, at the conflux of river Ganga and Bay of Bengal, makes this site an important pilgrimage centre. Kapil Muni Ashram is the major attraction on Sagar Island where thousands of Hindu devotees come and pay their respects to Saint Kapil, an incarnation of Lord Vishnu. As per legends, it is believed that when Kapil Muni cursed the sons of King Sagar to death, the descendant of his sons, King Bhagiratha, helped in the descending of river Ganga through deep meditation in order to get his ancestors' souls purified. 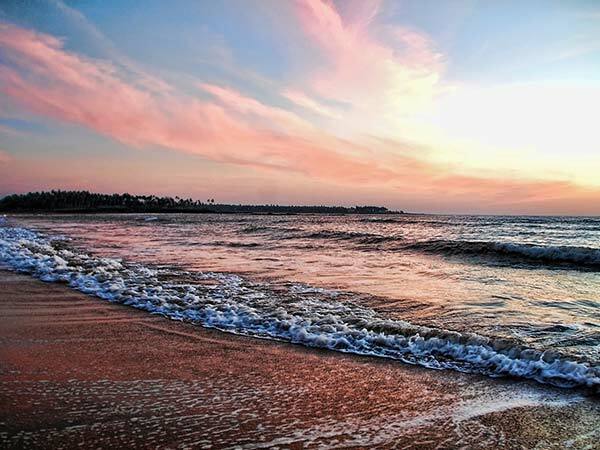 Sagar Beach is another important destination for those who love to explore the beauty of nature. Once you are done with the religious sites at Sagar Island, you can savour the perennial beauty of Sagar Beach. The spectacular views of the beach at the time of sunrise and sunset should not be missed. Sagar Beach is a perfect place to free yourself and relax amidst its delightful environment. Sagar Island witnesses the second largest religious gathering during the time of Makar Sankranti, which is also believed to be the date when Ganga descended on earth. Hindu devotees come here from every corner of the world to take a dip in the pristine waters of Ganga and free themselves of their sins. Being a pilgrimage site, it hosts thousands of pilgrims every year at its annual fair, which happens during the month of January. Another place of interest is the lighthouse of Sagar Island, which is located at the Sagar Beach and is popular amongst tourists for the beautiful views of the island, which one can savour from its top. If you are a photographer, then you must visit this towering lighthouse in order to capture the best of beauties at the time of dawn and dusk.